GERMANICUS was brought back to the ludus on a stretcher, but Ahenobarbus's doctor is sure he will be OK, it is just massive loss of blood. But it means he will need time to recover and cannot help to solve the Paulinus problem for Athenodorus. GALLUS returned in triumph, and just as importantly unscathed, after delivering the best win yet (OK, almost the only win) for the ludus. He wins a further 4 aureus, taking his total to 6, and he now has the skills of Dodge and Attack. Slip away and report back to Ahenobarbus. Attack Paulinus and risk inflicting collateral damage if it gets messy. Stay unseen in the shadows, observe, and wait on events. Through his endeavours in the arena, Gallus has demonstrated a somewhat slow response to situations. Hopefully this will change at some point… However, in light of this, Gallus will demonstrate patience, selecting option 3, and waiting for an opportunity to act! GALLUS hides in the shadows, unnoticed, and observes the trio walk down the narrow alley between the temple and the wall of an adjacent building (the Gardens of Mus). They open a postern door in the wall and go inside, into the Gardens. Just as GALLUS is about to follow them, two more people come from the other end of the alley and also go through the door. Then some more. Within a few moments about 20 people have gone through the door, at least half of them women, and none, except for Paulinus and his associates, well dressed. What can it mean? It is starting to get light now and people are appearing on the streets to go about their daily business. A couple of real gardeners appear and start to sweep leaves. GALLUS will have to leave soon, or attention will be drawn to him. Strike now, even though it is light and there is a risk of being seen by witnesses? Get cold feet, do nothing, and go back to Ahenobarbus and report? Wait until Paulinus has gone and try to sneak through the door, into the Gardens, and satisfy his curiosity? Gallus is in two minds, he thinks there might be something good for him behind the wall, but he will follow orders instead and go for option 1 and strike. GALLUS'S training kicks in. He moves quickly up to Paulinus's side, from out of line of sight, and runs him through. Paulinus staggers and falls. The woman stands transfixed and horrified, and then starts to scream "murder". Worse, GALLUS thinks he recognises her from somewhere, and thinks he sees recognition in her eyes too. She turns away to try and escape, he grabs her from behind and cuts her throat. Then he runs for it, amazingly no one has intervened or raised a hue and cry (I diced for this, GALLUS was lucky!). Probably any actual witnesses peering around corners etc are slaves and want to keep their heads down. If they become involved in an investigation they will inevitably be tortured for their evidence. Slave evidence was only admissible if it had been obtained by torture. Rumsfeld and Cheney should have been Romans! GALLUS makes it back to the ludus and reports. Ahenobarbus is relieved the business seems to have been successfully finished, and rewards GALLUS with 4 aureus (total now 10) and various other delights. Over the next few days reports of the " 'orrible murder" circulate through the City. Rumours fly, especially about a political connection. Eventually, some days later, there is an official announcement from the office of the Governor, G Licinius Mucianus: the victims were Christians, probably murdered by hard line Jews. The Jewish community is fined 1,000 aureus which provokes some unrest but most people think they had it coming. Here is a crime scene photo of the investigation into the murders of Paulinus and his mistress Thaiis, crypto-Christians. The evidence points to an assassination by "sicarii" - Jewish bandits and extremists. One theory is Paulinus has refused to pay protection money, or to funnel payments to the revolutionaries fighting to free Judea from the Romans. The figure shown in the photos is a slave gardener, who saw nothing, standing in the alleyway where the bodies were found. Another theory is that Mark is getting too involved in the back story !!! Athenodorus is proclaimed City Aedile for the coming year. There are no Games scheduled for several months because it is harvest time and many of the City plebs are away in the country as seasonal workers. Also many of the elite retire to the comfort of their country estates to escape the heat. However Athenodorus is organising some private amusement for himself and his cronies at his villa a few miles south of the City, on the coast. Ahenobarbus receives a 'request' to attend and bring some gladiators. It is understood there will be some VIP guests attending. Good entertainment is essential and will be well rewarded. As the games begin, Ahenobarbus notices a small group of Romans with Athenodorus and a couple of his romanised Greek friends. There are guards discreetly posted. He thinks he recognises the Governor, Mucianus, and also Vespasian who is supposed to be in the south conquering the Jews. But he has no time or inclination to dwell on this, politics is not for people like him. This was the toughest fight of Gallus’s career, and at the same time, one of the most entertaining fights witnessed. It took a long time, a really long time. For most of the fight, Gallus was on top, Carvillos was both injured and exhausted, but just stayed in the fight. It was a fight of small hits that accumulated. Eventually, Gallus also became injured an exhausted. The crowd really got into it, cheering on both gladiators at various times. 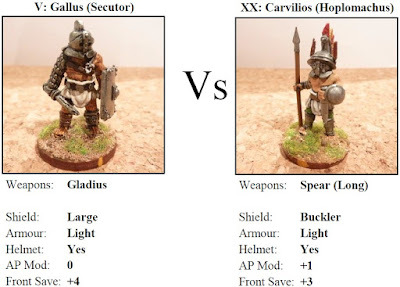 It was in fact the wild cheers that kept the fighters going – Gallus had to overcome a -3 to AP (injured + exhausted) and could not even perform a simple pivot, without the crowd egging him on. Carvillo ended proceedings with a double 2 special hit. A 5 was rolled for the appeal, but there were enough bonuses to get it to 8, so Gallus survived. Gallus was on top for most of the fight, but Carvillos only really came back at the very end. Gallus is seriously considering conversion to some strange cult, like that of Mithras, as he heard gladiators gain some luck from that god. 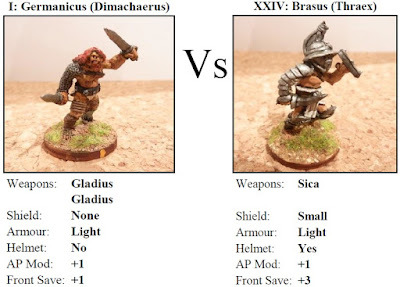 This was a really hard fight for Germanicus as Brasus had the attack skill, which allowed him aggressively push the lightly armoured Germanicus around. It was very quick, two fast hits in and Germanicus was felled in a few moves. It went to appeal, but there was a final modified score of 4 – curtains……. That was the situation, in the private fight, it is in the hands of the host…. One thing that was distressing, the tendency of harsh crowds is too be unforgiving at the end, being it private grouping or large arenas. What is wrong with these Antiochans? Ahenobarbus must be tearing his red hair out.